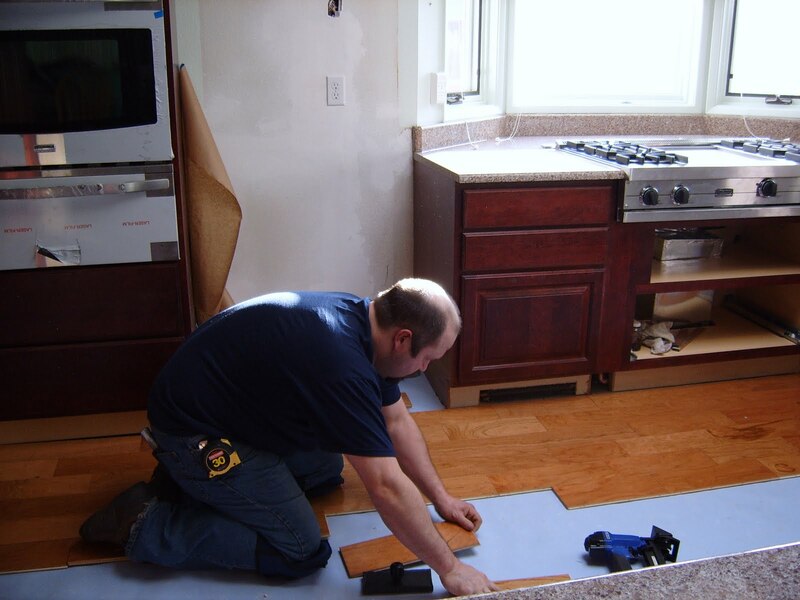 At Camai Bed and Breakfast in Anchorage, Alaska, we planned our kitchen remodel to use environmentally friendly products. The new hardwood kitchen floor is a product of Columbia Flooring. Our B&B’s flooring is a light cherry engineered hardwood floor. Columbia Flooring crafted it from renewable resources grown and manufactured here in the United States. The flooring was manufactured without using urea-formaldehyde which is traditionally used to manufacture composite wood flooring. Columbia takes its role of being an environmentally friendly company seriously. Early in January the flooring was delivered so that it could acclimate to the interior heat and lack of humidity of our home. The flooring was placed over a product made by The Silencer to do just that—muffle the sound in the rooms below the kitchen. The product claims to be the finest acoustical underlayment for all wood floors. The floor installation was just completed tonight by Eric Kollander. This entry was posted in Uncategorized and tagged green, hardwood floor, kitchen remodel by admin. Bookmark the permalink.